Apparently, my sister, Dovima, has reached her statute of limitations with me constantly photographing, Thurber, the family dog. "Christmas, is over, am I stuck wearing this red bow until New Year's?" She has asked me to shoot a Christmas day family portrait of her with Sweet Pea, her daughter/my niece, and Herb (with a silent h), her husband/my bro-in-law. In return, my sister, has taken it upon herself to shoot an action shot of me sitting in-between our pappy and brother, Axel. Axel worrying about the sodium content of the Christmas dinner for everyone in America. 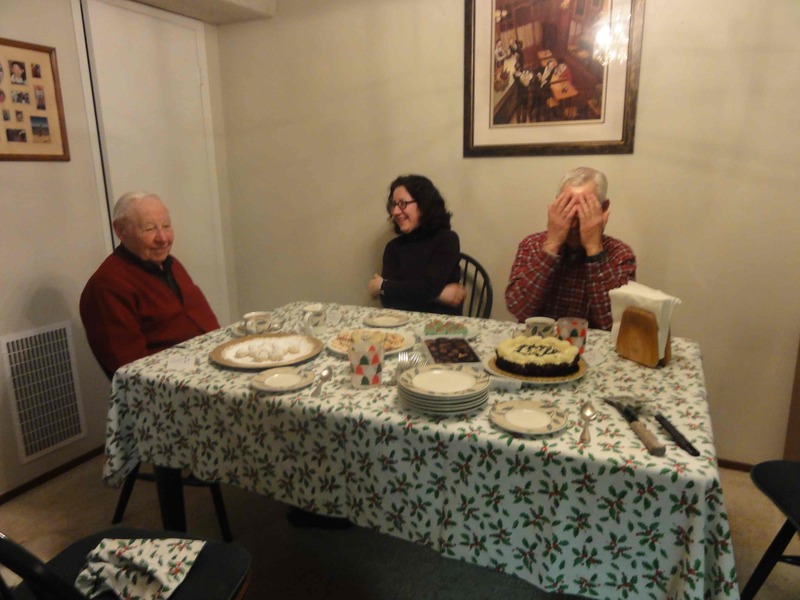 This entry was posted in christmas, holiday, Humor and tagged dog, family, photographs, siblings. Bookmark the permalink. Poor Thurber! Our Lucy is still wearing her red bow, but then she’s way more prissy-looking than Thurber, who looks like he may be a cousin in breed, but not one when it comes to haute couture. Thurber greatly appreciates your empathy. 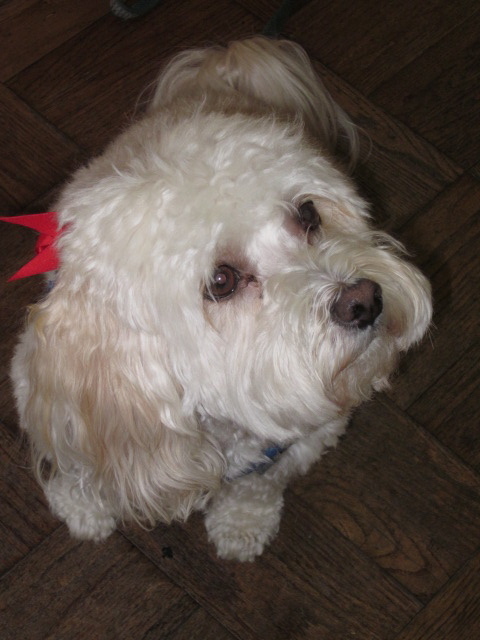 The red bow hides his macho Poovanese (Poodle/Havanese) side. As Thurber’s advocate, I’ve suggested that when the tree comes down, the bow should come off. Knowing Thurber’s luck, he’ll be stuck wearing it through February. I love it!!!! Where do we get the limit licenses? I have a few friends who need to be given limits on the pictures of their cats. I also need to buy up all those licenses so there’s no limit to my really bad photography. Tell Axel, I enjoyed my salt this Christmas. Axel secretly enjoyed his salt, too. Thanksgiving and Christmas are the only days of the year he allows himself to eat food with flavor. Love these photos – especially the last one! One is worried about all the sugar there on the table, one is eagerly waiting to have his first taste, and the other is just bemused by it all. Wonderful! Glad you enjoy our pix! The last one was shot by my sister, Dovima, accessing her inner Diane Arbus. I object to your Christmas dinner attire. I have a red bow waiting for you when you return to NYC. Happy Holidays to you and your family. Your photos are poignant; can’t have enough of Thurber, not only because he’s got a cool name (according to this writer) but also because pets never last long enough for you to get too many photos: I just put to sleep our teacup poodle, Jetta — sweet little thing, and sensible: “Fetch the socks, Jetta.” “Why should I do that? They’re right there. You can reach them.” She was 11, had a brain tumor, the vet thinks. I wrote her obit on my blog. Also, I envy your being in Calif. — I miss it; lived most of my adult life out there, at the other end of the state, Los Angeles. 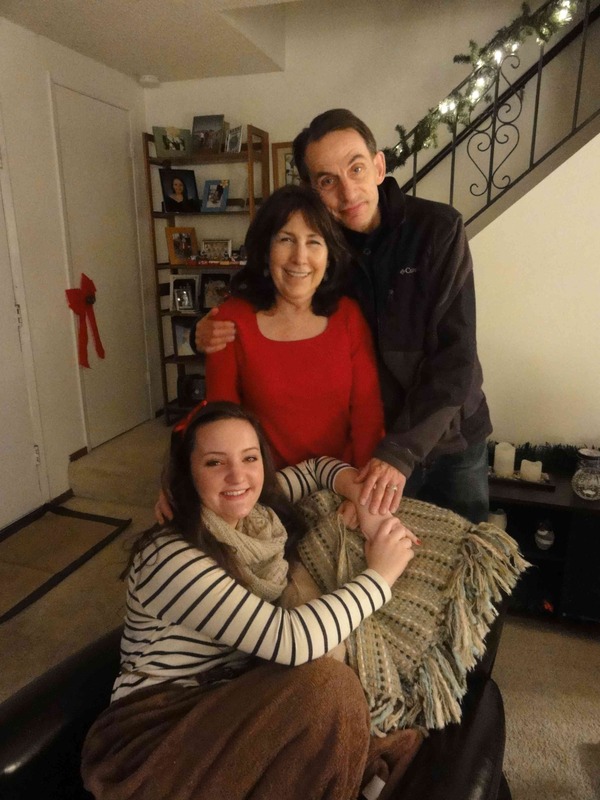 I have enjoyed sharing Christmas with you and your family. Thanks. Too bad you can’t post Sweet Pea’s cookies on your blog for downloading…. Sweet Pea and Thurber love your comment! Sorry to hear that Jetta has joined our first family hound, Mean Streak, in the big kennel in the sky. Axel feels your pain. He’s been in mourning over having to put down his 24-year-old cat, Kiki, but he has his back up cat, Rocky, to help him through this rough time. Yeah, it’s a drag that their lives are so much shorter than ours. Happy Holidays to you, too, Samantha! A 24 year old cat. Wow. What a luxurious friendship for Axel. My condolences to him. Kiki was a stray when Axel adopted her at least twenty years ago. The vet figured she was around 24 when she entered the scratch post in the sky. I like seeing family photos!!!! Axel loves seeing himself on the Internet like this … But Thurber’s feeling pretty good.